Piercing the Reich is an operational level simulation of the Battle for Aschen, 12 September to 21 October 1944. 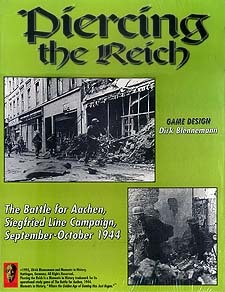 Piercing the Reich is modelled after a modified version of the popular Triumphant Fox game system, using an innovative, interactive sequence of play. With individual formations activated, the focus is on command control, keeping both players constantly involved in the action. While Operation Market-Garden was in final preparation, Hodges of First Army led his leading elements towards the Westwall fortified line south of Aachen. If successful, he envisioned the opportunity to drive through the fortified line, crossing the Roer River, and perhaps reaching the Rhine River. After that, who knew, maybe even home by Christmas? Although initial resistance from battered remnants of the Wehrmacht was light against Hodges' First Army units, powerful German reinforcements were quickly thrown into the fight, including Tiger Tanks, Sturmgeschutze, Sturmpioniere, Panzertruppen, SS Kampfgruppen, and a newly-structured type of infantry division known as the Volksgrenadier-Division. Although Aachen was cut of after only nine days of intense fighting, it would take the US forces several more weeks before the last German resistance in the city collapsed. Aachen became the first German city captured by Allied soldiers in World War II.